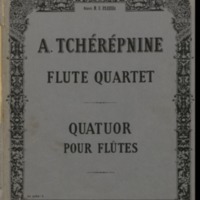 Quatuor pour flûtes / Alexandre Tchérépnine. 1 part (flute 4) missing. In the church -- Parents hope for children -- In the kitchen.